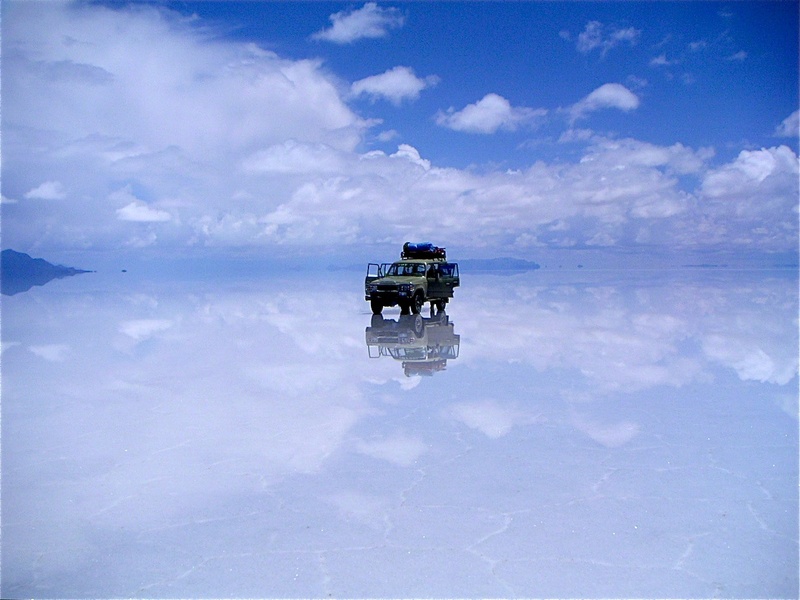 The world’s most extensive salt flats are one of the most spectacular sights in all of South America and, along with the Inca Trail to Machu Picchu in Peru, considered the top highlight in the entire continent. 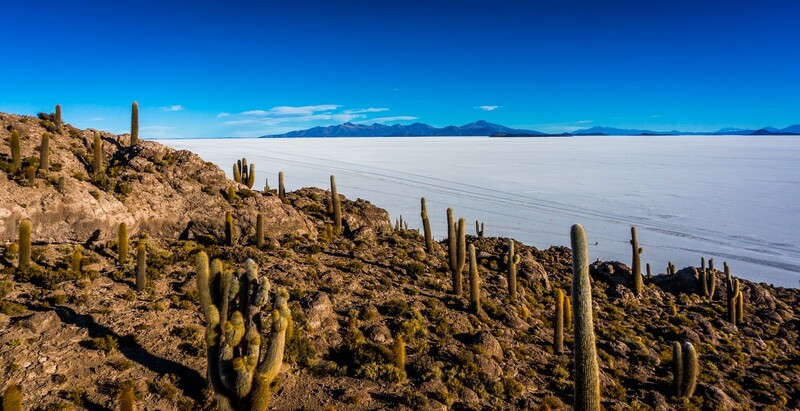 Found on the Bolivian Altiplano in the south-west of the country (near the border with Chile), and covering an area of more than 10,000km2, the Salar de Uyuni (Salty Flats of Uyuni) is the most popular destination in Bolivia. 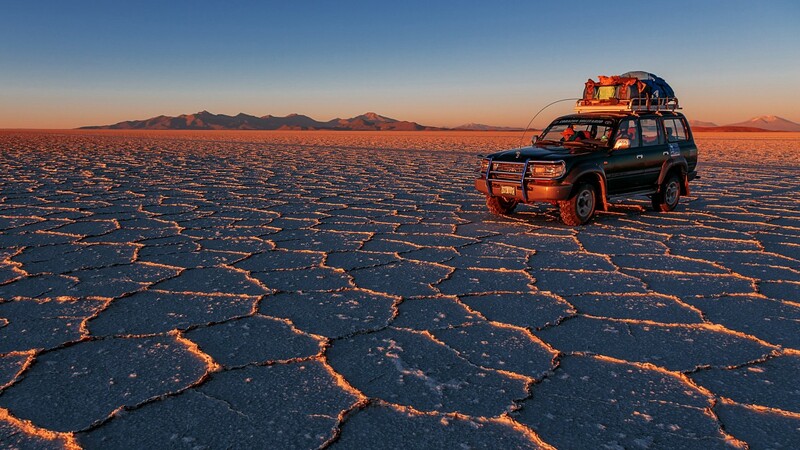 Crossing it north to south, form Uyuni to the Chilean desert town of San Pedro de Atacama, is the epitome overland trip for adventurous nature-lovers. The unique landscape and endemic wildlife here are second to none, although the remoteness and high elevation makes the multi-day trip quite the arduous venture. Nevertheless, it is also one of the most rewarding adventures one could have in this part of the world. What makes the sight so magical, especially if travelling at the right season, is that the moist salt flat below mirrors everything above it creating the illusion that the earth and the sky are connected and not divided by boundaries. 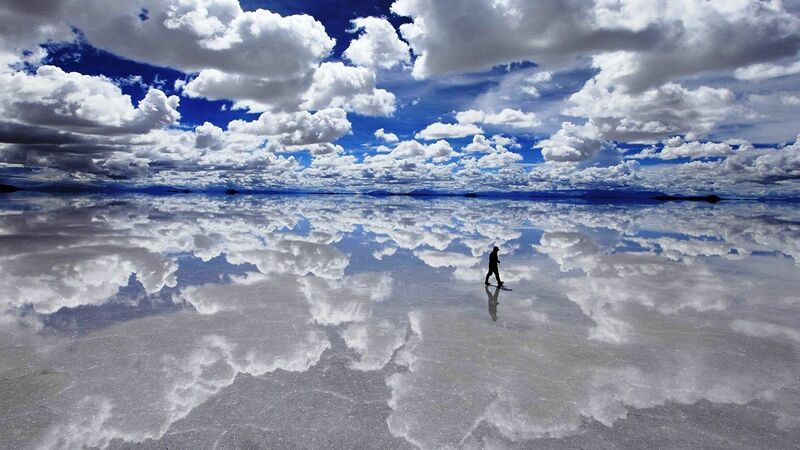 This enchanting image is produced by the mirror-like, shimmering, crystal surface of the salt flat. Undertaking a crossing of the Salt Flats will also gift you the chance to discover the Bolivian Altiplano, with its magical and colourful lagoons, therapeutic hot springs and utterly surreal landscapes. Want to see “heaven on Earth”? You’ve come to the right place. If you were to visit this area some 40,000 years ago, you’d be standing on the shores of Lake Minchin, one of the largest prehistoric lakes which existed in this continent. The eventual evaporation, and the leaving behind of a mindboggling stratum of salt, spawned two prime salts flats, one in Uyuni and one in Coipasa. The former is by far the largest and most impressive to visit. Various small islands, topped with cacti and various flora and fauna, are what remain of prehistoric volcano peaks, and make for fascinating stop-overs on the long drive across the blinding white plains. 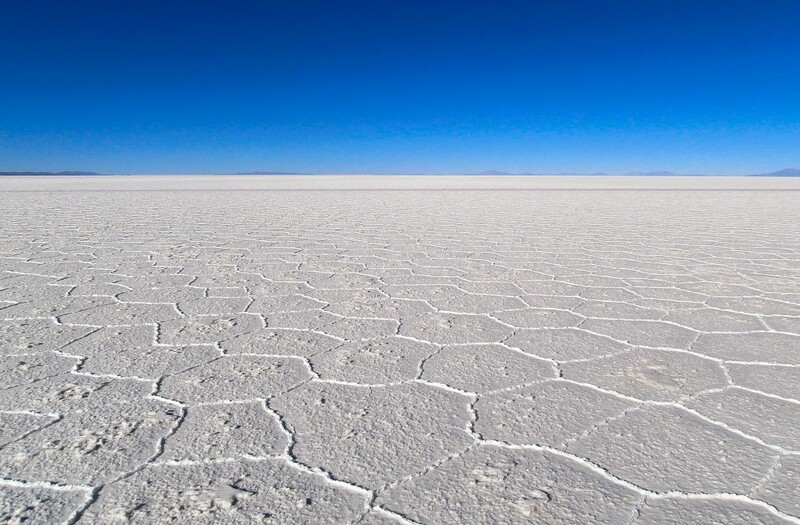 Along with brine and mud, the salt flats contain an enormous amount of lithium, making the Salar de Uyuni the biggest deposit of lithium on our planet. 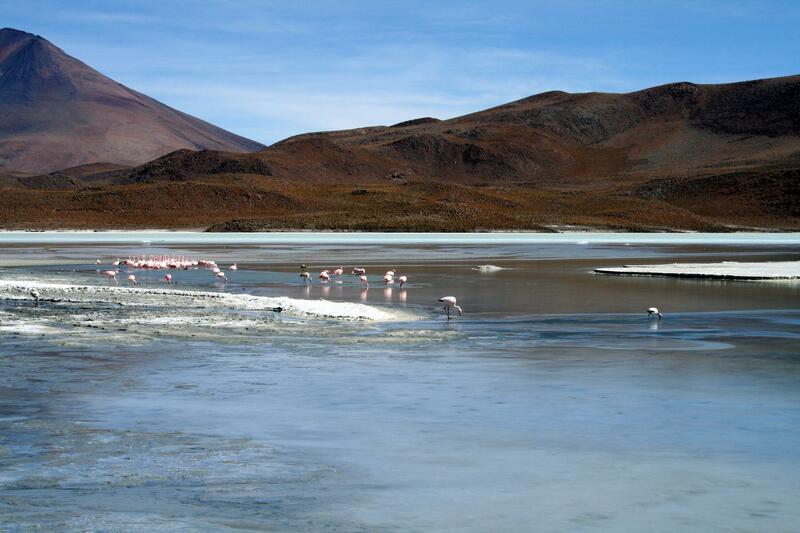 When it comes to prime materials, Bolivia is to lithium what Saudi Arabia is to oil: its most enticing resource. It currently supplies 70% of the world’s lithium needs but, if large multi-national mining corporations have their way, it could satisfy the world’s needs, many times over. The mining of this formidable place faced many protests when first initiated, asocals have been harvesting salt here for eons and the prospect of their supplies being decimated by major lithium mining (lithium is the main mineral used in the making of batteries, particularly for new hybrid-car models), is of continuous concern. Yet the Salar de Uyuni represent a priceless sector of the country’s tourism industry, and no-one wants to see this area mined ad infinitum. 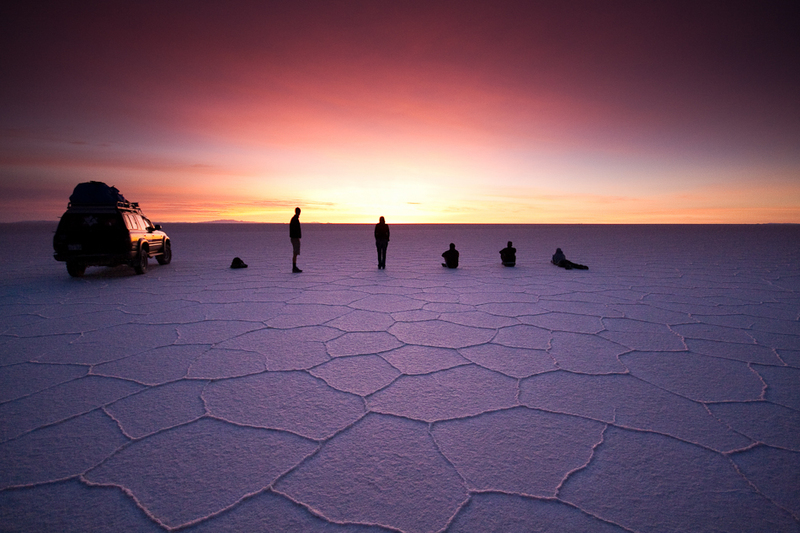 Although doing a day trip from Uyuni is certainly possible, and give you a ‘taste’ of what these Salt Flats are all about, nothing beats jumping in a 4WD with a group of other travellers, and heading out into the wide white wonder for a few days. The Salt Flats are enticing and interesting to visit at any time of year, although your transport options are limited during wet season, which is a time when many vehicles become stuck in the mud. Out here, getting stuck means a two or three days wait for a tow, so it’s certainly a concern for those short on time.It is best to visit during May and November as these months are dryer and an expedition to the whole stretch of the Salar is possible. This is also the prime breeding time for a particular species of pink South American flamingos. On an average multi-day expedition, you’ll get to cross the Salt Flats on the first day, enjoying visits to some of its most famous landmarks (like the Salt Hotel, salt factory and Fish Island). 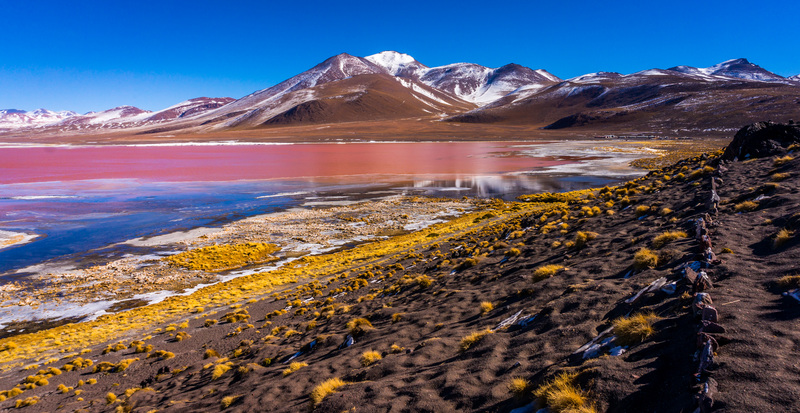 On the second day you’ll spend the day driving along the shores of the awe-inspiring Laguna Colorada and Laguna Hedionda (home of the flamingos!) and crossing the barren rocky landscapes which are reminiscent of Dali-inspired art. The third day usually includes a visit to Laguna Verde and a stop at an area brimming with geysers and hot, natural, thermal pools. On the last day, you’ll either make the long trek back to Uyuni if that’s what you prefer, or continue on to the Chilean border and the charming desert town of San Pedro de Atacama. 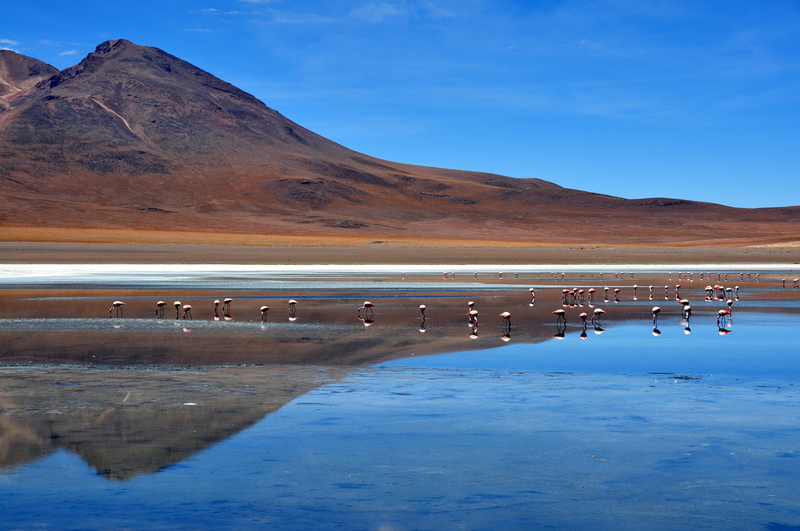 All agencies in Uyuni offer both return and one-way trips and, if intending to do this trip in the opposite direction (starting for San Pedro de Atacama) do note that trips starting in Chile are, on average, 50% more expensive. Food and accommodation are included in all trips, and you’ll be overnighting in specially made lodges both on the flats, and along the route of the Altiplano . You’ll be sleeping in the same guesthouses no matter which company you choose to go with, or from which direction you choose to travel. Budget travellers choose to get here by bus from the capital (15hrs), Potosi (4hrs) and Sucre (4hrs). 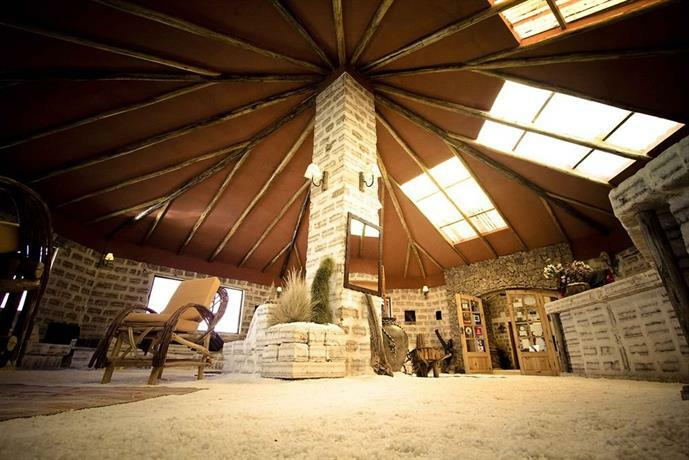 Uyuni is abundant with cheap and cheerful hostels and guesthouses as the primary customers here tend to be young, adventurous backpackers. However, there are a couple of flashier hotels too, including the relatively lux Palacio del Sal which is one of the many here made entirely of salt! Everything in Uyuni is within walking distance and, if you’re looking for what will probably be the best meal you’ll ever have in South America, you may to check out the Minuteman Revolutionary Pizza. 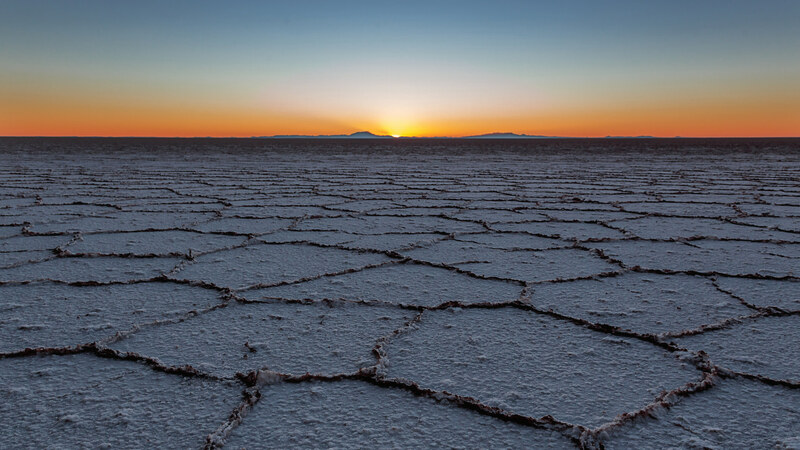 There are a few things to consider when undertaking a crossing of the Salar de Uyuni. There are a few unscrupulous agencies that offer a world of luxuries on their trips, and charge accordingly. Please keep this in mind when doing your research and, if possible, ask friends for personal recommendations. Conditions along this route are basic as can be (dorm beds in guesthouses, good but basic food etc) and local tour providers could not offer more than that in this remote region, even if they wanted to. Moreover, pick a tour with new(ish) 4WDs as they’ll tend to have fewer flats and breakdowns along the way. If in doubt, search out for the major foreign overland companies (you’ll see them travelling in large herds) and approach the guide to ask for a recommendation. These companies tend to use the best local agents and may even be able to squeeze you into one of their groups if they have space, especially if you are travelling alone. 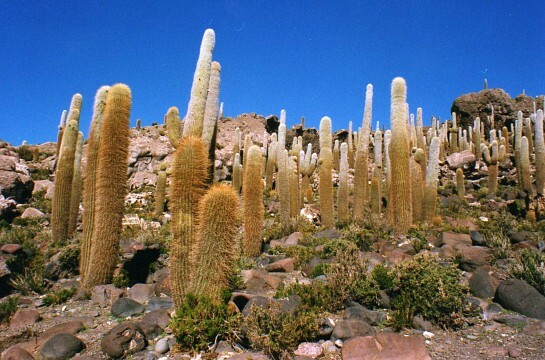 All tours include a comprehensive tour of Uyuni itself but do note that these tend to be only stop, flash and go affairs as, without fail, tours always start a few hours later than they’re supposed to. The town’s Train Cemetery is an immensely interesting site, so make sure to include a few days in Uyuni before or after your tour, to visit this site at length and on your own. Life at high altitude is harsh at night, at any time of year. Pack accordingly and make sure you have warm clothing with you. Moreover, the sun reflecting on the salt flats can be quite brutal, so bring plenty of sunscreen, lip balm, a hat and (most importantly) sunglasses! Rent an extra sleeping bag and buy a small hot water bottle in Uyuni before leaving, as your sleep will be greatly enhanced by both.